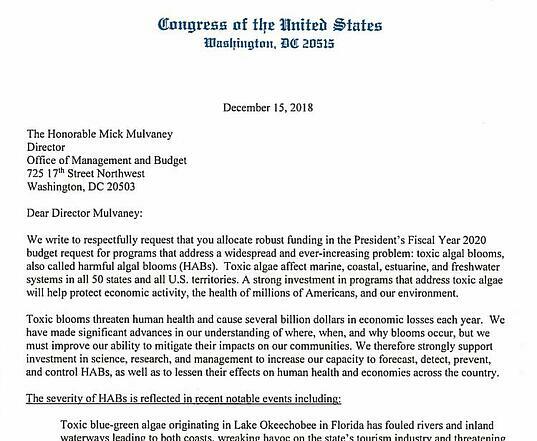 The letter details HAB events in recent history and specifies their detrimental effects on tourism, drinking water, human health, food supplies of indigenous peoples, and the aquaculture industry in communities around the nation. The examples include the Microcystis outbreak on Lake Okeechobee and its associated waterways with reported microcystin toxins 50 times higher than the safe-for-human-contact levels, and amnesic shellfish poisoning associated with HABs stretching from California to Alaska, and Rhode Island to Maine that suspended shellfish harvesting. An excerpt of letter submitted by Congress to the Office of Management and Budget in December 2018 lobbying for increased budget allocations in 2020 to support HAB research. and improving awareness of how HABs interact with other environmental stressors like hypoxia." Take a look at the letter. Is your state represented in the signees? If not, contact your congress person and educate them on the importance of HAB research and the detrimental effects of HABs in your community. If you're unfamiliar with how the FlowCam can be used in HAB research, download the Top Studies on Cyanobacteria Reseach to learn how the FlowCam has been used in six influential cyanobacteria studies.